life isn't perfect, but can still be yummy and fun! For our recent birthday party, we decided to do a science experiment for our party favors. 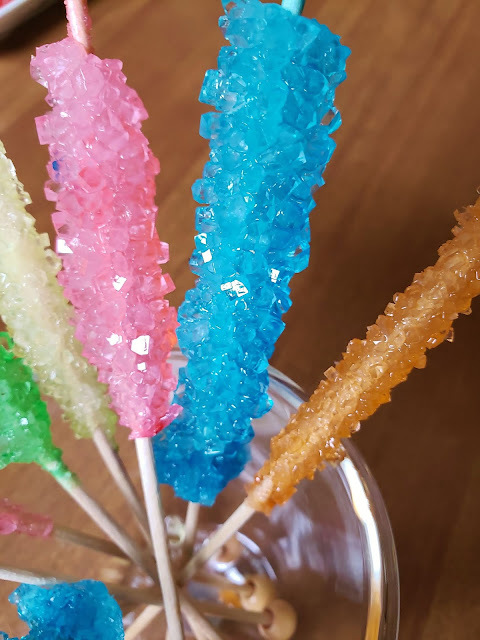 Rock candy! It was pretty easy to make, tasted great and was fun to do with 'Lil Lass. It was a great exercise in patience, as well. We let ours sit for about two weeks. It was fun to watch the sugar crystals grow! 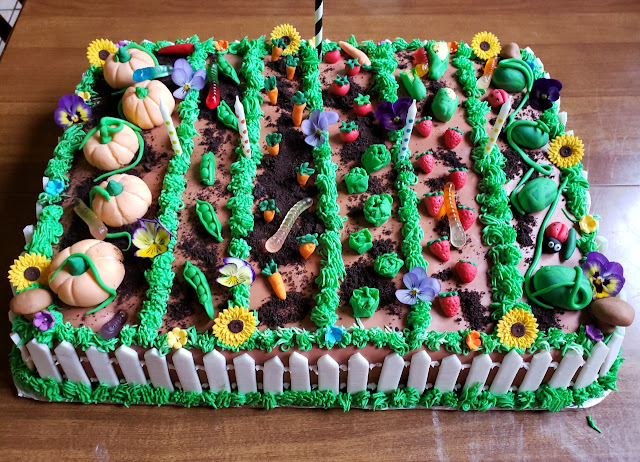 For 'Lil Lass' fourth birthday recently, she chose a "Pansy and Garden" cake theme, complete with rows of veggies, fruits, real pansy flowers and baby gummy worms. I think she chose this theme due to the pansies she's been caring for that she started from seed in February, and because she has enjoyed helping to plant our veggie garden. And who doesn't like gummy worms? It's that time of year for asparagus! This is the first year we've been mostly on top of the every-other-day asparagus picking. We've been eating asparagus fresh, sautéed, grilled and roasted. Yum! 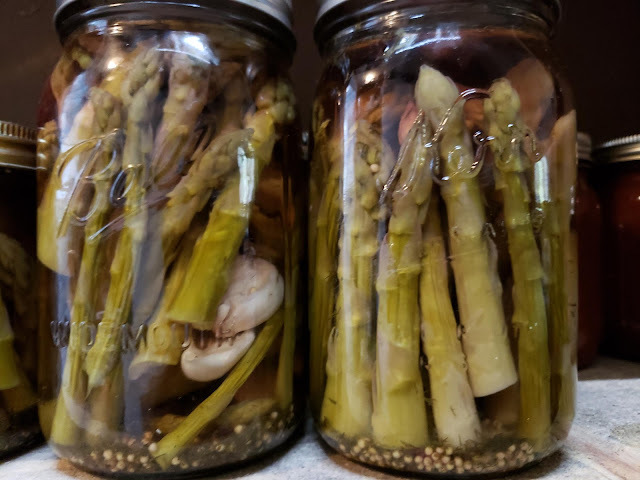 My new thing this year was to try pickling asparagus. I used my favorite pickling recipe, and I've got my first batch done. Of course we had to try it right away. It was delicious! Pickle-y, with a nice crunch and great asparagus flavor. A great way to use up your extra fresh asparagus! I'll be making several more batches this year to preserve for the winter. Well, it's been about 4 years since I posted. Oh my goodness, the time has just flown! We've been quite busy and have since added another member to our family, Lil' Bit, who is now almost 2! Lil' Lass is almost 4 already. It has been a very busy last couple of years, as I'm sure all you parents of young children/children can relate to. Lately, I've slowly gotten back into doing some fun cooking and baking. With the cooking and baking, has come the desire to get back into blogging. So here I am! Hi! First of all, I wanted to apologize for my lack of blogging lately! Between working full time still and trying to get ready for the baby, its been a little too busy to do very much blogging. Want to see some of the things I have been up to? I took the plunge and finally decided to stop storing all of these Taste of Home magazines! I am going through each magazine, entering the recipe I want to try or keep on the Taste of Home website, and adding it to the virtual "recipe box" on the website. No more storing all of these paper magazines! (the chair is the 'done' pile and the table is the 'to do' pile - yay - I am almost done!). Ah, the temperature has finally risen to the 60's, and even the 70's on some days! The sun is shining and the snow is pretty much gone. I think spring is finally on its way! To celebrate I made these Raspberry Tartlets. I love making pastries, and I love making mini pastries even more! These raspberry tarts begin with crisp-but-not-too-sweet almond crust. How many times have you been baking, and realized you need self rising flour? This has happened to me more times than I can count. Of course, you can buy pre-made self rising flour, but did you know it is also very easy to make on your own? All you have to do is stir three basic ingredients together - flour, baking powder and salt. Easy peasy! The "kissing crust" is a baking term that refers to the pale, soft edge on a loaf of bread where it has touched another loaf while baking. I feel like this idea of not being quite on top of things (like separating the pans of bread in the oven quickly enough) and yet still getting a yummy finished product accurately demonstrates my cooking, baking and life right now!